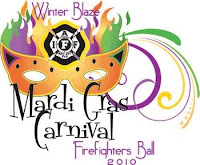 It's time to “ignite the night” at the annual Tacoma Firefighters Ball - Winter Blaze 2010. This years Mardi Gras themed event will be held at the Emerald Queen Casino this Saturday January 30th at 5:30 p.m. Activities include silent and live auctions, dinner and outstanding raffle prizes. Emcee's Brooke & Monti of Movin' 92.5 FM, (The Ladies Room), will keep the evening movin' in true Mardi Gras tradition. You may find yourself caught-up in a parade, catching beads and dawning masks. Back by popular demand to headline the entertainment for the evening will be the Spazmatics and Afrodisiacs. Proceeds for the event benefit the American Cancer Society - Camp Goodtimes. For ticket information visit the Tacoma Firefighters Local #31 web site. We hope to see you there!